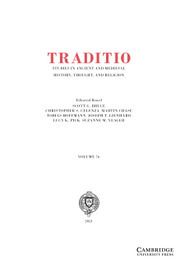 Traditio is an international journal, published annually and dedicated to the study of ancient and medieval history, thought, and religion. Traditio publishes monographic essays, critical editions of texts, and research tools such as catalogues of unpublished manuscripts. Submissions in English, French, German, Italian, and Spanish are accepted. Articles have treated history, literature, philosophy, patristics, philology, theology, and history of art. The periods covered are antiquity, early Christianity, and the Middle Ages, up to A.D. 1500.